Ryburn United won the Halifax FA Albert Crabtree Cup for the first time in their history with a thrilling 1-0 win over Huddersfield Amateurs at the Shay last night. Strike ace Christian Silkstone got the all important goal five minutes into extra time. It is the first time a Halifax AFL side has won the trophy since 2005 and Ryburn were gaining compensation for their vain pursuit of Calder ‘76 in the title race. 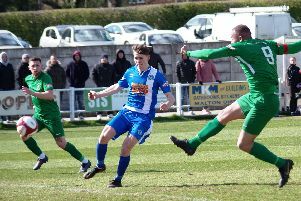 The game had all the makings of a great final from the off with the West Yorkshire League Division Two title contenders Amateurs advertising their potential aerial threat through Jonny Crowther and Matt Parker. The game was end to end and Joe Swallow was looking lively for Ryburn but defences had the better of the early exchanges. Owen Wilkinson did well to block Parker’s effort inside the box following good work from the Elland side’s Adam Oldfield and Lee Thrush. Ryburn were containing the Amateurs well with Ashton Richardson outstanding at the back. Silkstone was put through but his first touch let him down and Tom Greenwood made an easy save for the Amateurs. Parker put a header just wide but the Amateurs were struggling to unlock the tight Ryburn defence. Five minutes into extra time Ryburn got the breakthrough. A Carl Maguire free kick was helped on by Richardson and Silkstone stabbed the ball home at the back post. Ryburn got a warning that the game was not won when a Lee Thrush free kick thundered against the post and bounced to safety. The closing stages were wide open as the Amateurs tried in vain for an equaliser, Ryburn having the better chances to make the game safe. Last night’s Halifax AFL, Division One: Calder 76 Res 2 (G.Martin N.Dempsey) Denholme United 2 (T.Priestley M.Midgley).